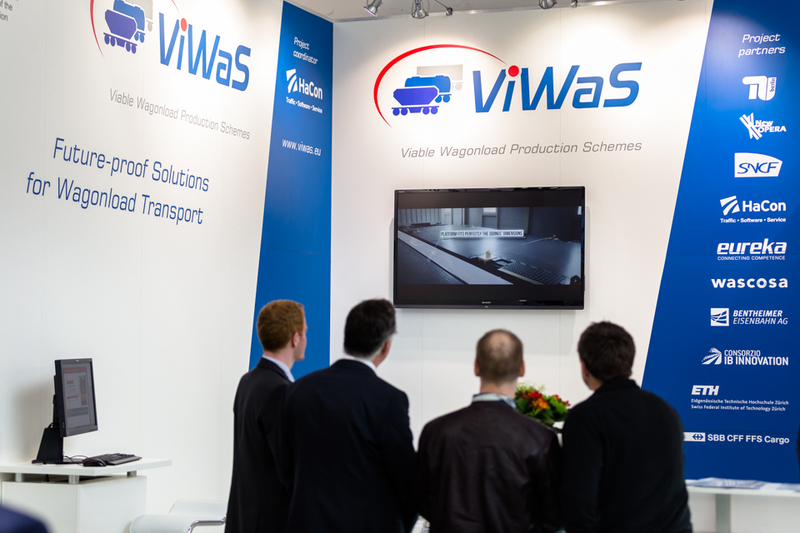 From May 5 – 8, ViWaS participated in the world leading business fair transport logisitic in Munich. The consortium presented the theoretical components and production schemes at stand B6.122 as well as the technical outcomes in the open-air site. 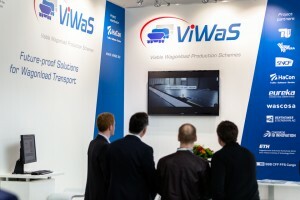 On Wednesday, May 6, a ViWaS presentation in the SwissMovers pavilion topped off the project’s exhibition appearance. Located directly next to the stands of project partners HaCon and Eureka, detailed information about the general goals, innovations, production schemes, and status have been presented in hall B6. Through a unique ViWaS design, the stand set itself apart from the surroundings. In addition to a presentation that illustrated the project areas including the recently finished film on a large screen display, a terminal has been installed for the provision of more detailed information. Throughout the fair, project partners provided visitors with facts about the progress and upcoming activities. 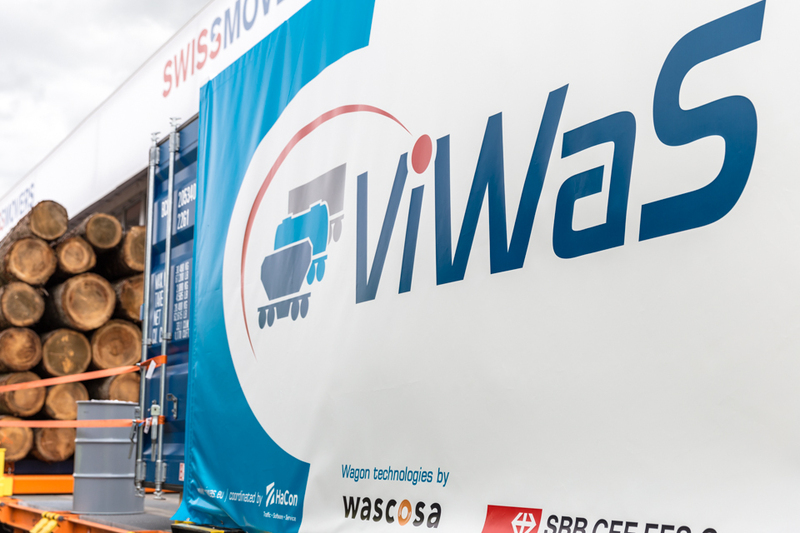 As part of the SwissMovers, ViWaS partners SBB Cargo and Wascosa presented their modular wagon technologies developed within the project on the open-air site. A Flex Freight Car was the basis of the stand equipped with a Timber Cassette 2.0 and a Container Loading Adapter. 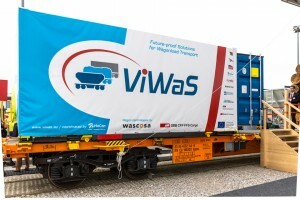 Thus, three ViWaS innovations have been presented at the same location. In order to attract attention, a cover for the container on top of the Loading Adapter has been designed. On the inside of the standard 20’ container, visitors could watch the ViWaS project film or read the latest newsletters. Personnel from SBB Cargo, Wascosa and HaCon supplied visitors with details about the displayed project outcomes. About 30 attendees stopped by the SwissMovers pavilion on Wednesday, May 6, for the dedicated ViWaS event. 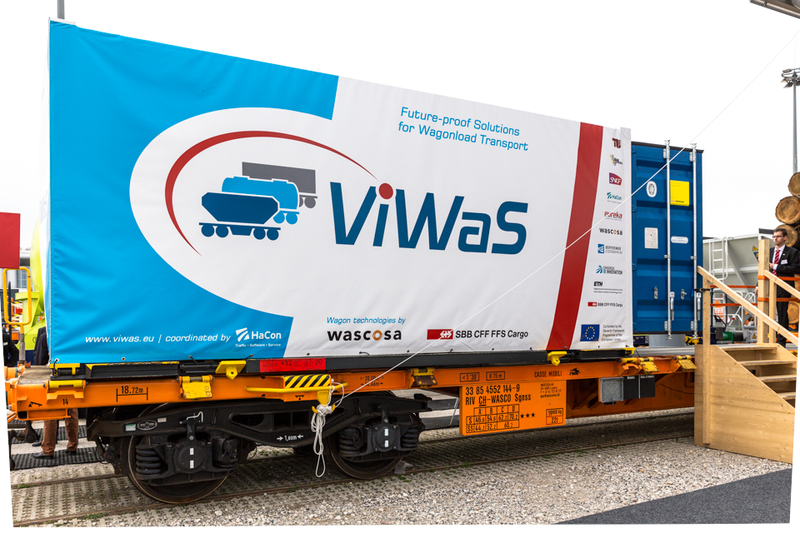 During four presentations visitors were informed about different topics: the general project idea, Eureka telematics, Wascosa wagon technologies, and SBB production schemes like Swiss-Split. More photos from the transport logistic are available within the Media Centre.